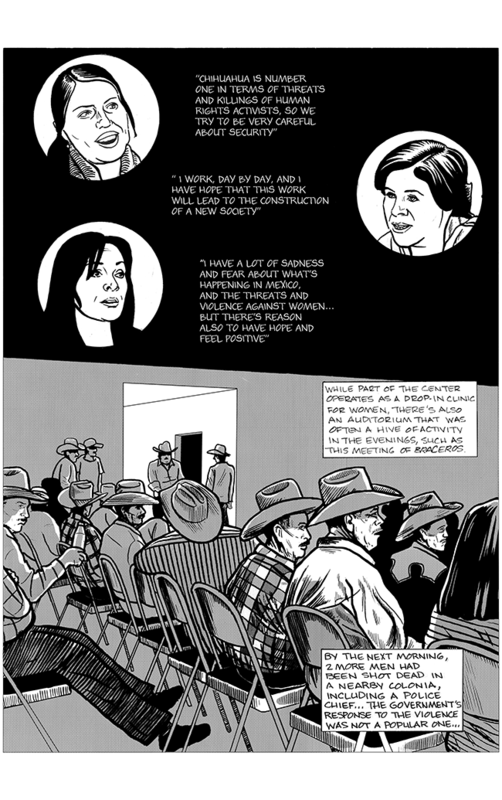 La Lucha: The Story of Lucha Castro and Human Rights in Mexico is a nonfiction graphic novel and the first in a series of forthcoming books focused on depicting and narrating the lives and struggles of human rights defenders (HRDs) to defend the human rights of and achieve justice and accountability for communities worldwide. Front Line Defenders fundamentally believes that HRDs are vital actors in promoting open and just societies. 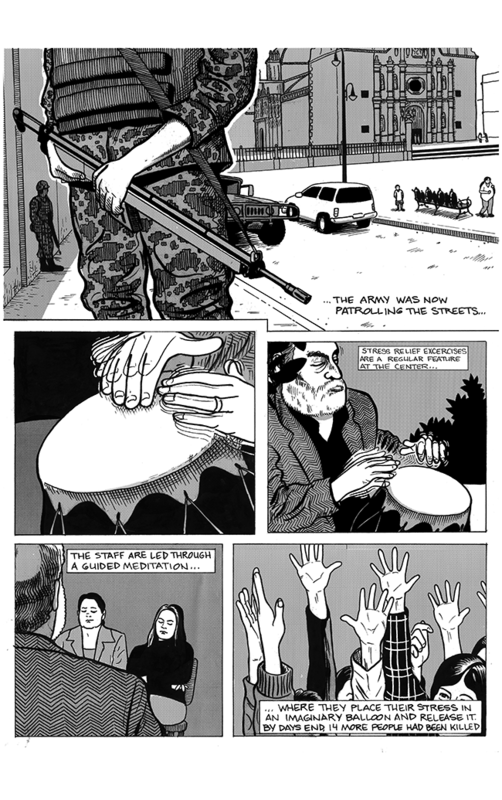 The graphic novel series was conceived of as a means of engaging new audiences to understand and appreciate not only the work, but also the challenges and risks HRDs face every day. 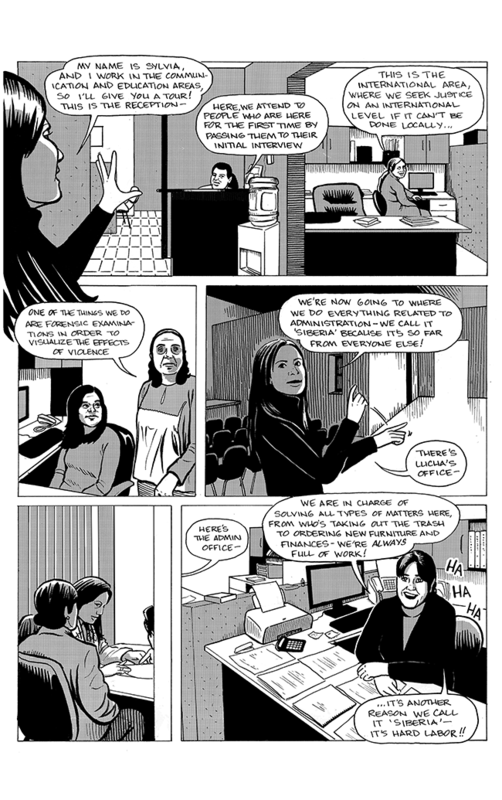 La Lucha was created as the first book to point a spotlight on the high risk that HRDs, particularly women, face in Mexico. 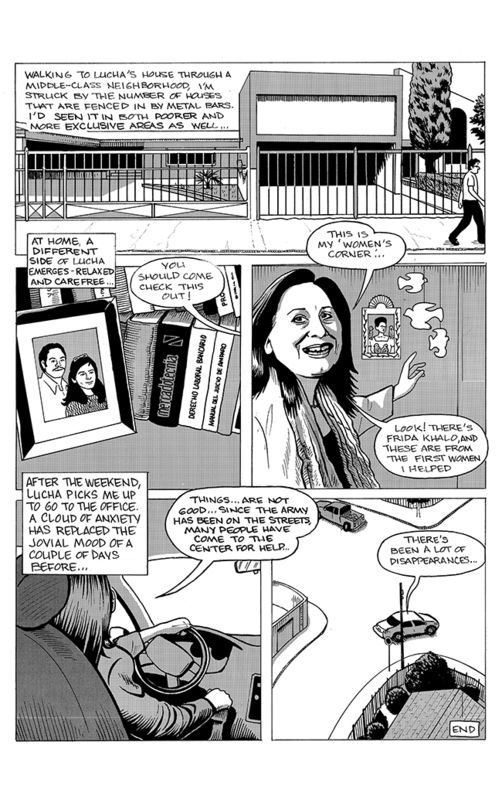 The chapters in La Lucha tell the stories of women and their families who are threatened, detained, hunted down, and killed for their insistence on justice in Mexico. 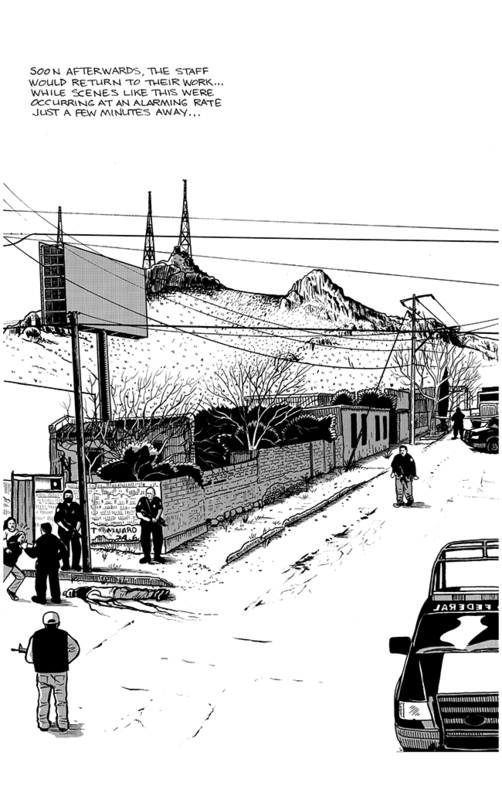 The murder of Mexican women is not a story from the past, and La Lucha is not a history book. It is a horror story, and a story of incredible courage. Some have called femicide in Mexico a worsening “epidemic,” and like an outbreak of an infectious disease, the people stepping up to fight it are the ones most at risk. Reaching audiences who normally would not read a human rights report is critical if HRDs are going to find support from their wider communities. This is particularly true in Mexico, where the HRDs in the book live and work, and where public support is a critical element of overall protection in a society where violence against HRDs (and journalists) is rampant and often goes unpunished. 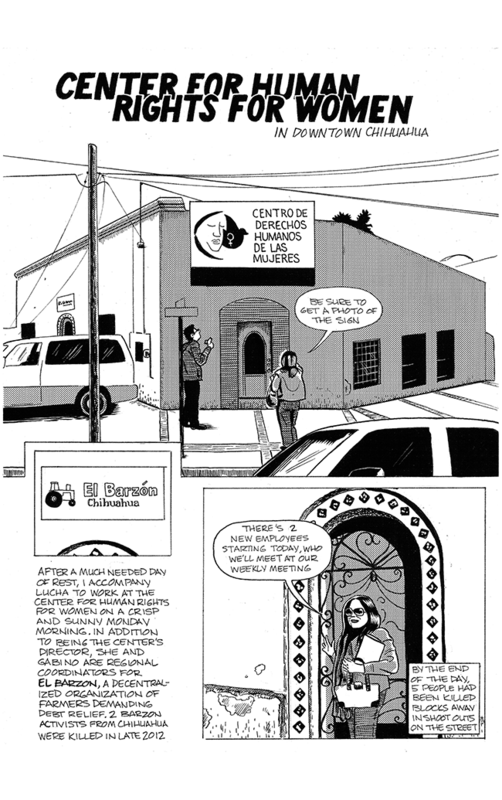 After publishing the book in Spanish in Mexico (with Editorial Resistencia), Front Line Defenders worked with El Centro de Derechos Humanos de las Mujeres (The Centre for Women’s Human Rights or CEDEHM in its Spanish acronym) in Chihuahua to build support among key supporters in the state. Following the gubernatorial elections in Chihuahua, which brought former Senator Javier Corral to office in October 2016, Front Line Defenders initiated discussions with the state institutions (education and governor’s office) to introduce the book into the curriculum at secondary schools and universities in the state. As senator, Corral had hosted the launch of La Lucha at the Mexican Senate in November 2015. Following a series of meetings, Front Line Defenders has entered into an agreement with the education administration of the state to introduce the book in September 2017. Front Line Defenders expects to publish the next two books in the series – one on HRDs confronting the mining industry and working to defend land rights and protect the environment; and the other on LGBTI rights defenders in countries where homosexuality is criminalised – over the next two years. Seeing the way forward can be difficult when you receive death threat phone calls and the organisation you belong to, the Centre for the Human Rights of Women – Centro de Derechos Humanos de las Mujeres – is under constant attack. When the highest court in the Americas, the Inter-American Court of Human Rights decides to place you on its small and select list of beneficiaries of Provisional Measures, because your life is in danger; and when your close friends have been killed just for defending human rights. Our voice is sometimes lost or silenced. The strength in our legs sometimes falters, and fear can paralyse us. The risk I have placed my family under, the price I pay is very high. My three daughters, my son and my five grandchildren live far away from me. For security reasons I live apart from them, and not a day goes by without a longing seizing me, when I think that I will not be there when my grandchildren take their first steps, or when they say their first word or have birthday parties. To my grandchildren I am a stranger who visits each year to show them love for a few days and who they hardly remember. When the danger escalates, the phone starts ringing. “Mum what are you doing there, come here, we can take care of you” and I tell them, fire fighters love their profession, they do not want to get burned, but when there is a fire they go out to fight it. The same goes for doctors, when there is a risk of contagious epidemic they face the disease. In Chihuahua there is an epidemic of human rights violations. That’s why I’m there. In my organisation, we started by defending human rights in gender-based crimes, that is to say femicide, trafficking, domestic violence and sexual violence. Then the invisible victims of the war on drugs came knocking on our doors; mothers, daughters, sisters of the tortured, the forcibly disappeared and human rights defenders under threat. In all modesty we became the Front Line of Chihuahua. Human rights defenders have faced up to political and economic powers, however there is now a new player which has increased the risks, namely organised crime working hand in hand with the police and military to implement mega-projects, with no qualms about threatening, torturing or murdering activists. In the place where I work, there are areas where organised crime has supplanted the state with the complicity of the authorities and where women and girls are the most vulnerable. I am talking about women from villages who are forced to coexist with criminal groups, and with the police and military. Women walk in terror under the menacing gaze of men who are ready to be fire their weapons, raid any home or take their children as the spoils of war. In the logic of this armed conflict, it has become difficult to distinguish members of organised crime from the police, to the point that it is impossible to discern the perpetrators of attacks. I have held hands with hundreds of women in peaceful civil resistance to prevent evictions; I have offered my arms for a hug when suffering disrupts their lives. I have clasped my hands together so that women can climb up and reach their dreams of living a life free from violence and raised my voice so they can be heard. On my way through law school as a young college student, the seeds were planted in my heart, and from these seeds grew the strength and rebellion that still drives me today to long for a more just world. At some stage in my life I was a successful entrepreneur in the field of drilling wells. However while doing that job a desire for a different world sprang into my mind, along with a rebellious impulse to search for alternatives in my personal life. That is to say, every day the belief grew stronger in me that I could not be part of inhumane structures which offered me a more or less comfortable way of living, as long as I forgot about those who were suffering. I refused to cooperate with a patriarchal and unjust system and I changed the direction of my life. My search for answers to the question “what should I do in this world”, took me to the seminary in Chihuahua to study theology, and this new narrative had a profound effect on my life. Of all the skins that I’ve covered my body with, the one that I feel best in is that of human rights defender, and I have two simple was to check whether the way of life I have chosen is best for me. The first is whether what I do makes me happy and I have decided to accept that the day that ceases to be the case, I will be looking for another path. The other way is by looking at my diary and reflecting on how I spend my life. Another way to assess my path in life is to drink from the wisdom of women in history. In my journey as a defender, I have learned to listen to the stories of women who suffer violations of their human rights, with compassion and a reverence that compels me to respect their lives. I am convinced that it is through acts of love and justice that we can proclaim the scandal of all the unjust acts imposed on women, represented by all forms of violence, many of them hidden. By empowering women we can encourage them to rebuild their lives.